Grand Hotel Ritz in Rome is a luxurious hotel, right in the heart of one of the most beautiful cities in Italy. 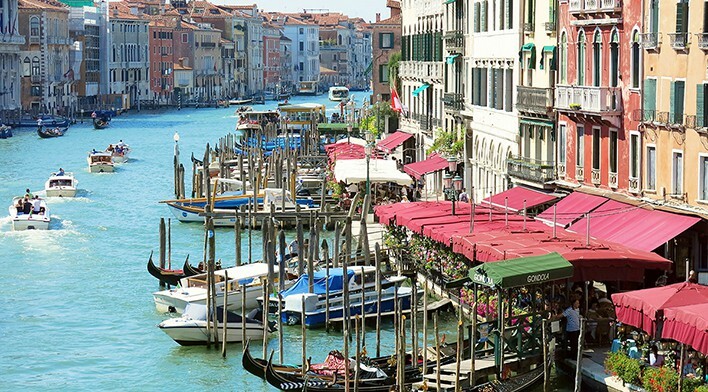 This is the place where dreams truly come true, where you can enjoy the best of Italian cuisine and stroll down the spectacular Roman alleys; hand in hand with your loved one. Wondering whether this is the hotel for your trip to Rome? 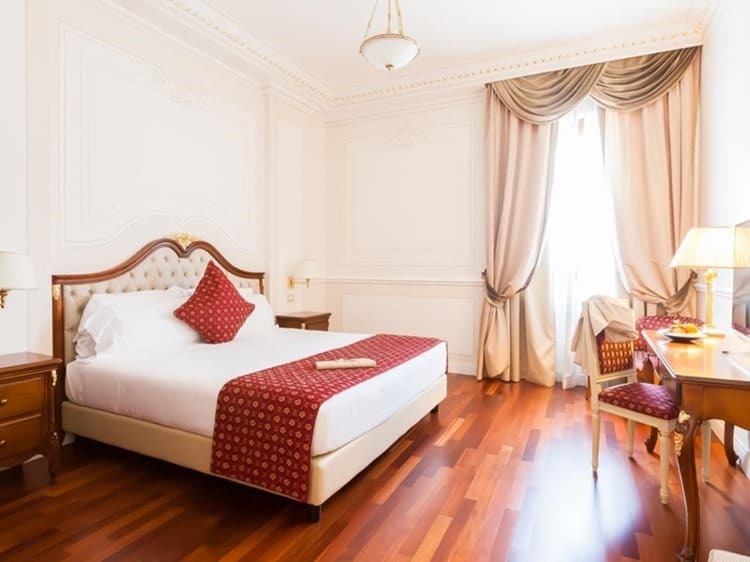 Keep reading to find our detailed Grand Hotel Ritz Rome review, but before you do, you might want to check the rates and availability for your dates of stay. 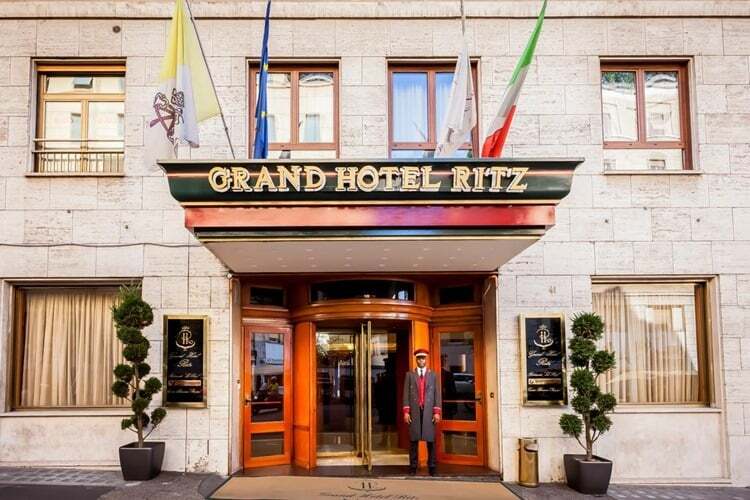 The Grand Ritz Hotel, Rome is a 5 Star hotel located in the heart of Rome. This beautiful hotel offers a variety of spacious and comfortable rooms which are furnished with different styles. Larger rooms also have private bathing suites, private terraces and spectacular views over the city of Rome. Grand Hotel Ritz Rome is located in Rome’s upmarket Parioli district and about one mile from the city center. 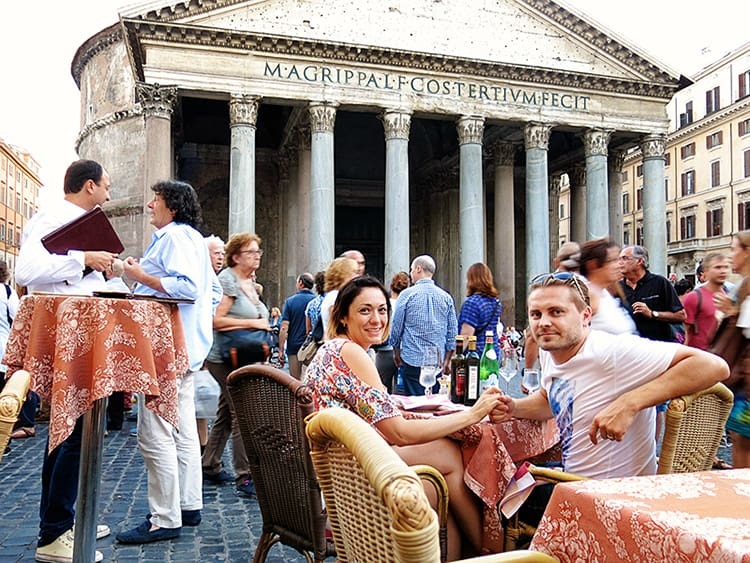 It is a tranquil base when you wish to explore the breathtaking architecture, ancient squares and palaces and classical ruins that the Italian capital is famed for. 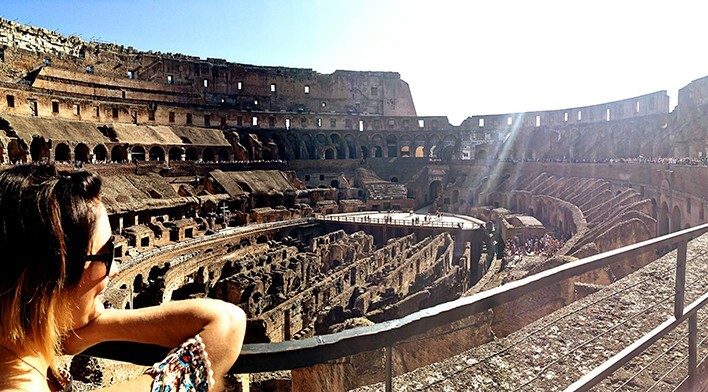 The hotel is located only a 10-15 minutes shuttle ride (complimentary) from all of the Roman historical hot spots. 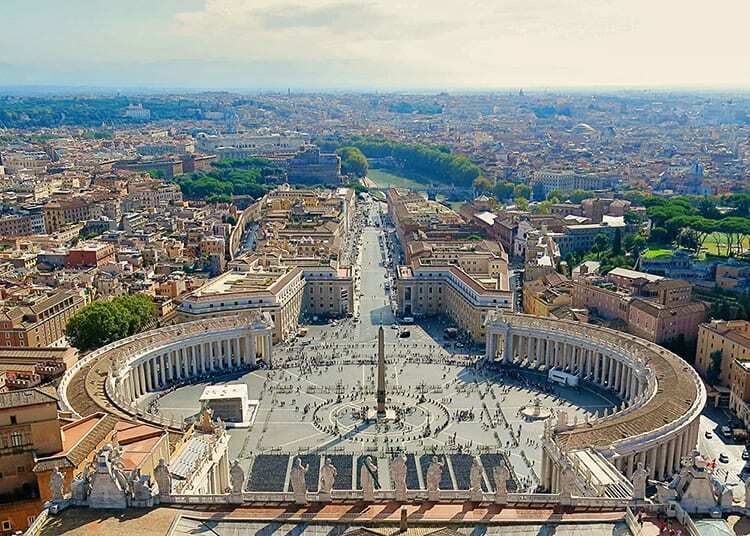 These include the Vatican City and the St. Peter’s Basilica, Colosseum, Pantheon and the most famous fountain of them all, the Trevi Fountain. However, if you wish to spend a day close by to the hotel, then we highly recommend to check out the spectacular Catacombs of Priscilla. If you yearn for majestic views and a delightful outdoor terrace, look no further than the modernistic Le Roof restaurant located on the 7th floor. It is the perfect setting for sampling delicious Italian food complemented by a marvelous wine list. The restaurant is designed with a contemporary style that combines the wall’s pastel colors with wengè wood and armchairs draped in faux leather for that exclusive and sophisticated atmosphere. The restaurant is open every day for breakfast lunch and dinner. 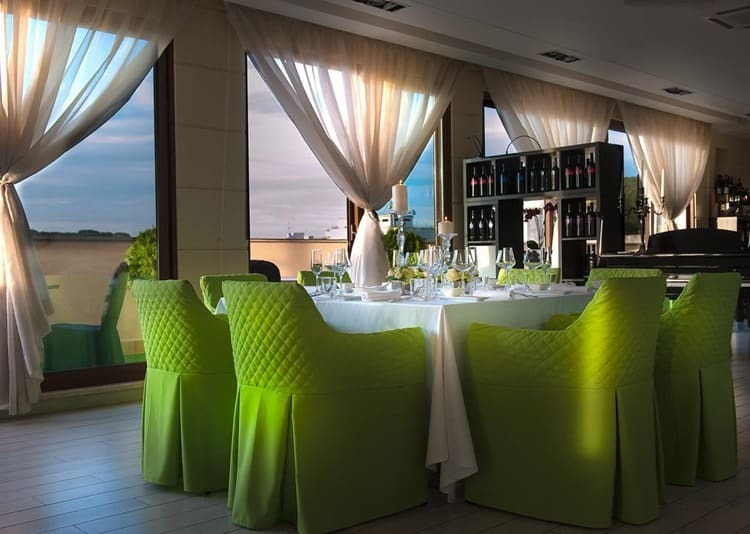 In addition, it offers amazing al-fresco dining where you eat as you bathe in the sunshine and enjoy the spectacular view over the Villa Glori Park and Piazza Euclide. For your post-dinner cocktail, you cannot go wrong with the Bar Dei Cesari-with its spacious living room, grand piano, luxurious sofas and a magnificent and unique tea room. Its name is derived from the plates that portray the Roman emperors on the walls and it is the ideal spot to relax, feel pampered and listen to live piano music while sipping some champagne or a cup of tea or coffee prepared from the extensive selection of brands on offer. It is also a great setting for a business meeting. When you want to re-energize your body and soul or just to relax and unwind, just head to the hotel’s first-class spa and wellness center. 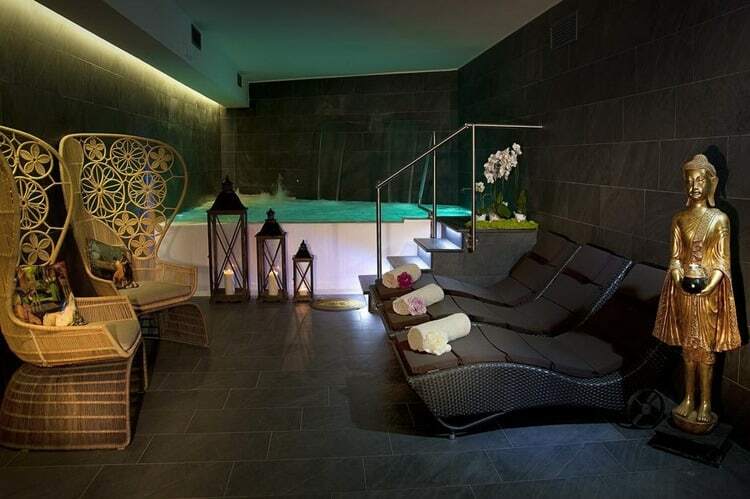 Enjoy total relaxation and bliss at the highly refined award winning Roman spa. What better way to spend a few hours of relaxing after a day of exploring the city! 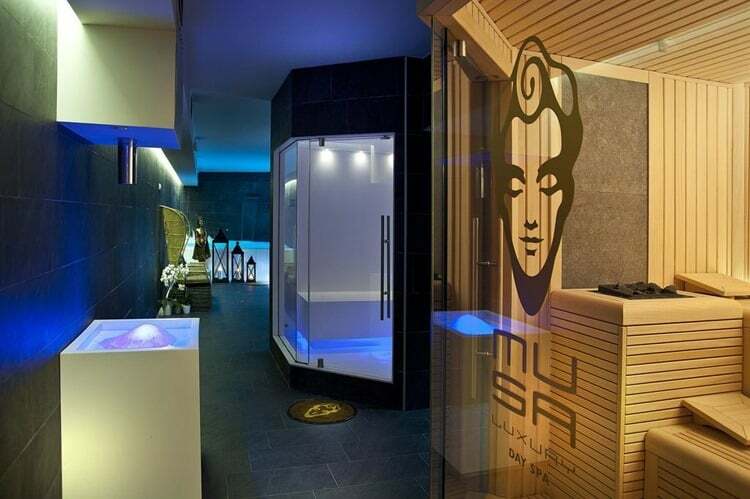 Musa Luxury Day Spa offers a large selection of massages, body treatments and facial treatments, all done with organic products. You can also enjoy excessive pampering in a Turkish bath, sauna, or with chromotherapy and in the ice fountain. Alternatively, you can take a swim in the pool or relax in the Jacuzzi. As you can see, choices of pampering at the Grand Hotel Ritz Roma are plenty! Did I mention a fully equipped Techno gym? Yes, this hotel has it all. The hotel’s 103 rooms are spacious and flooded with natural sunlight. Furthermore, they are equipped with parquet flooring and sound-proofed windows and the tasteful ensuites feature luxury toiletries, comfortable wool carpets, walk-in closets and smooth white-starched linens for that cozy,’ home-away-from-home’ feeling. Some of the rooms come with a Jacuzzi and a putting green if golf is your thing. If you are with your family or friends, there are spacious double rooms measuring between 248 and 269 square feet and larger deluxe double rooms which cover up to 300 feet square feet. The cavernous luxury suites cover an area of about 376 square feet and boast of ample living areas. Even though the rooms are designed to portray an old-world charm, they are fitted with LED TVs that show satellite channels. Other useful amenities that are provided include safes, hairdryers and free WiFi. The rooms also have minibars for refreshments and there is a room service option if you prefer to dine in your room. Premium bedding and phones are also available. The Grand Hotel Ritz Roma is an ideal choice if you are looking for a pleasurable break while visiting the ‘eternal city'. Whether you are visiting alone, with your family or as part of a group, you will love the hotel’s spacious rooms, elegant ambiance, easy accessibility from the city center, sumptuous cuisine, excellent customer service, peaceful environment and panoramic views of the city. The only question remains: what are you waiting for? 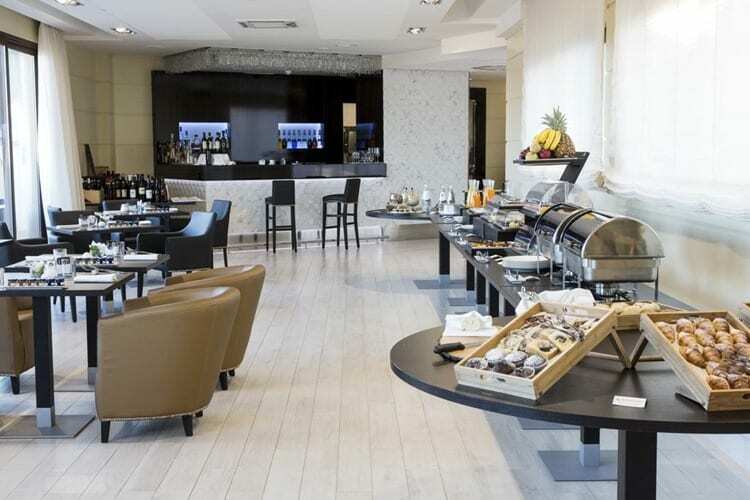 If you are after a luxurious hotel that is located in one of the best spots in Rome, then this hotel is the one for you! Does this look like the resort that you would enjoy staying at? 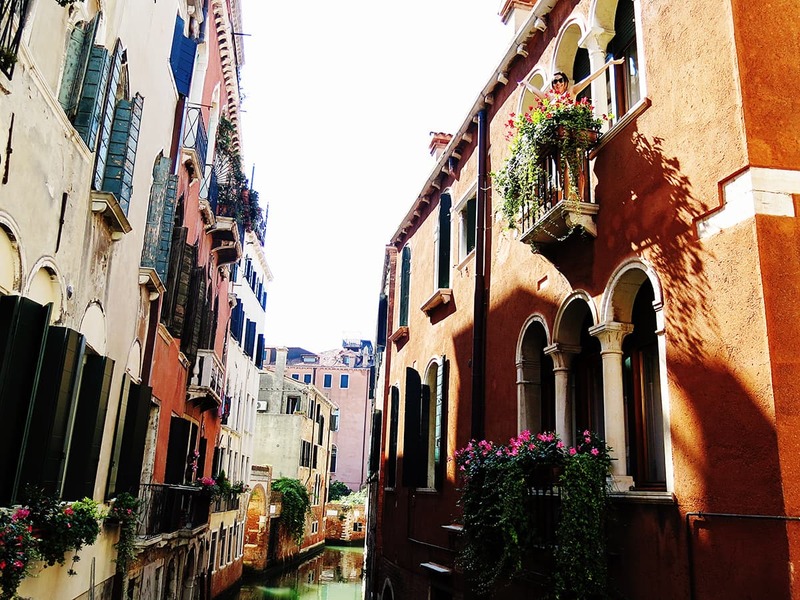 If you are still not sure, you might prefer to check out our post on where to stay in Italy to see which other Rome hotels we recommend.